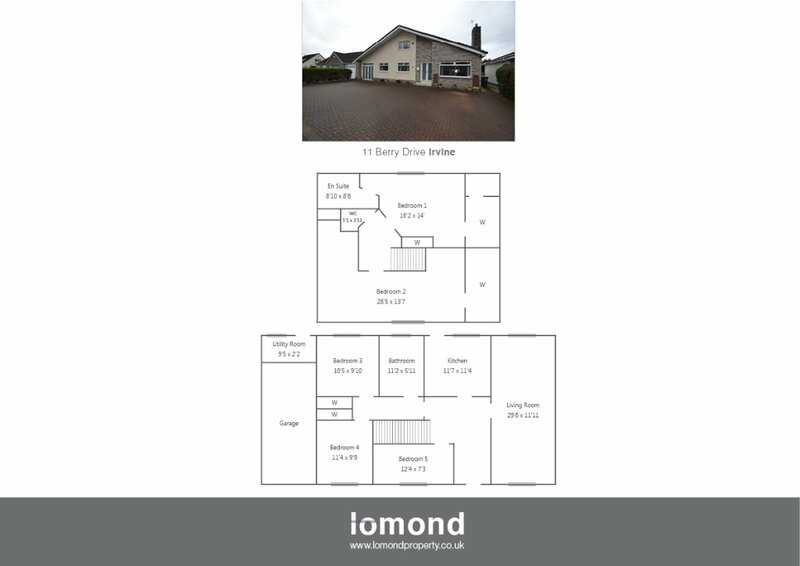 Situated in one of Irvine’s most popular streets, number 11 Berry Drive is a substantial detached villa occupying a sizeable plot with excellent family sized accommodation over two levels. The property benefits further from a self contained TV room with WC to the rear, and a converted garage to the front. In summary the property layout extends to a spacious and welcoming L shaped hallway with stairs to the upper level. The lounge area is stunning stretching the entire length of the property, complete with wood burning stove, and French doors to the rear garden. The kitchen is a recent upgrade finished to modern floor and wall mounted units, with integrated fridge, freezer, microwave, gas hob, oven and hood. There are three bedrooms on the ground floor, one of which is utlilised as an office by the current owners. The family bathroom is also new, finished to Porcelanosa tiles, with bath, separate shower enclosure, WC and WHB. The upper level has been re configured to create two large double bedrooms, with master en suite and a separate WC. The main bedroom is large with open views, and benefits further from a luxury en suite shower. Off the master bedroom there is a large walk in wardrobe/cupboard. The second bedroom has been re configured to create an L shaped bedroom with a further walk in cupboard. Externally the property has grounds to the front and rear. To the front there is off street parking for several cars. The garage has been converted to create a gym. To the rear the gardens are large, laid predominantly to lawn with a raised timber decking area, with indoor hot tub. Further to that there is a self contained outhouse with lounge area, and WC. The property benefits from gas central heating and double glazing, and a utility too to the rear. Berry Drive is a pleasant residential area. Irvine town is close by and provides access to a range of amenities including supermarkets, bars, restaurants and town centre shopping. There are a number of local primary and secondary schools within the greater Irvine area.